Sarah Nader- snader@shawmedia.com Veteran Wesley Peete of Ringwood listens to the National Anthem during Friday's Veterans Day assembly at Johnsburg Elementary School Nov. 11, 2016. Students performed songs and readings to veterans and family members in the audience. Sarah Nader- snader@shawmedia.com Fourth-grader Joseph Morgan, 10, shares his thoughts about veterans during Friday's Veterans Day assembly at Johnsburg Elementary School Nov. 11, 2016. 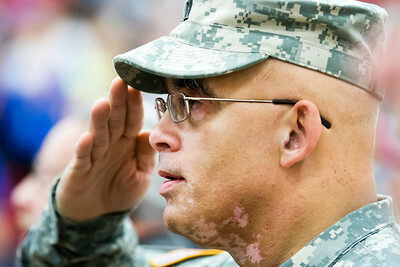 Students performed songs and readings to veterans and family members in the audience. Sarah Nader- snader@shawmedia.com Fifth-grader Kyle Patterson, 10, holds up an United States Army poster while different military branch songs played during Friday's Veterans Day assembly at Johnsburg Elementary School Nov. 11, 2016. Students performed songs and readings to veterans and family members in the audience. 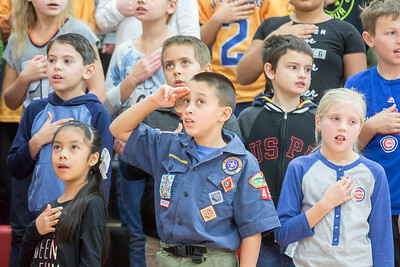 Sarah Nader- snader@shawmedia.com Third-grader Anthony Pena (center), 8, sings the National Anthem during Friday's Veterans Day assembly at Johnsburg Elementary School Nov. 11, 2016. Students performed songs and readings to veterans and family members in the audience. 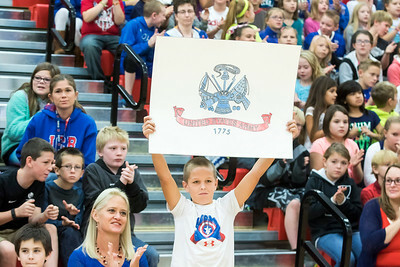 Fifth-grader Kyle Patterson, 10, holds up an United States Army poster while different military branch songs played during Friday's Veterans Day assembly at Johnsburg Elementary School Nov. 11, 2016. 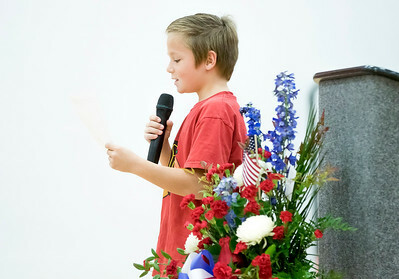 Students performed songs and readings to veterans and family members in the audience.